Erik Rintamaki was searching for rocks on a Michigan beach last summer when he made what he calls a "mind blowing" discovery. 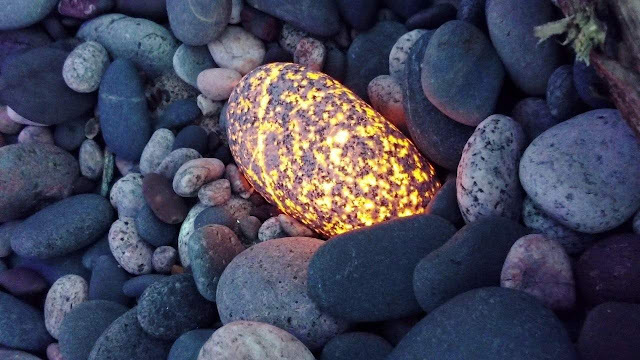 Resting among the thousands of pebbles covering the Lake Superior beach, Rintamaki saw a glowing rock. The gem and mineral dealer told CBS News he often goes rock hunting. 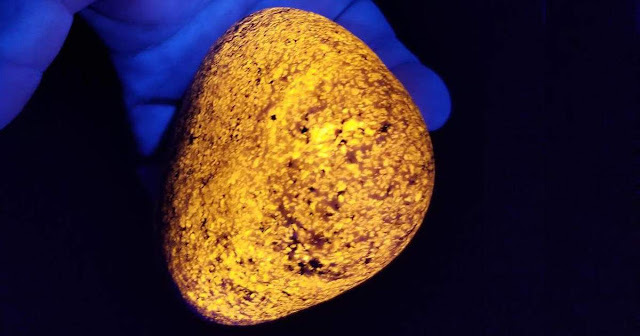 But on this particular June night, he found a rock unlike any other — a florescent orb that he later named "Yooperlite." Like lava glowing through cracks in the earth, a glowing light seeped out of the lines in the small rock. Rintamaki knew this couldn't be the only Yooperlite out there, but he couldn't find any information about glowing rocks online. He knows many people in the gem and mineral field, but everyone he asked had no clue what these mysterious rocks were. Rinktamaki went back to the beach night after night, carrying a black light which helped illuminated the glowing rocks. "I was blown away," he said. "It's insane how many are on the beaches up here." He started collecting Yooperlites by the bagful and sold them online. Michigan State University messaged Rinktamaki with an interest in buying some of the rocks to study. Michigan State, along with the University of Saskatewan, researched the Yooperlites for months. The universities determined that Rintamaki did, indeed, discover a new type of rock. He says other people may have spotted these gems before, but he was the first person to get Yooperlites verified — making him the self-proclaimed "Christopher Columbus of rocks." The name he gave them — Yooperlites — comes from the nickname "Yoopers," which refers to people who live in Michigan's Upper Peninsula, according to Mineral News, a newsletter for mineral collectors that reported on Rintamaki's discovery. When his discovery was verified and made public in May 2018, Rintamaki says life as he knew it changed. "I've had thousands of messages and I can't get to them all," he told CBS News. He now gives Yooperlite tours on the beaches along Lake Superior. "I've never had anyone not find stones," Rintamaki said of his tour groups. He takes groups out near dusk and they use black lights to search for Yooperlites for about four hours, he says. He also still sells Yooperlites and bought a machine that can buff them into perfect, smooth orbs. When he's not with a tour group, he finds himself looking for Yooperlites alone all night long. "I work the night shift at a casino, so when I get out of work at 2 a.m., I get to the beach ... I search until the sun comes up," he said. Rintamaki's passion has made him a local celebrity. He says his tours are booked solid through 2019 and the videos of his rock hunting have gone viral.